South Florida Sinus and Allergy Center (Plantation) - Book Appointment Online! At South Florida Sinus and Allergy Center, we offer our patients highly effective and individualized treatment plans. Our state-of-the-art facility provides a wide range of specialized solutions for a wide variety of sinus and allergy, snoring and sleep problems. When you choose to enlist our supportive assistance, you can be confident that you will receive the high standard of care that you need in order to improve your quality of living. We set a high standard of care not only in South Florida, but throughout the Country. 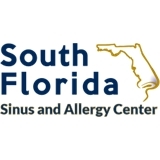 If you are looking for a top-notch and specialized medical treatment plan for your allergy or sinus problem, choose South Florida Sinus and Allergy Center. Very professional. Very nice office, great staff. Felt very confident in his abilities and knowledge. He took the time to explain the issues, gave definitive options and discussed them thoroughly. A real professional!